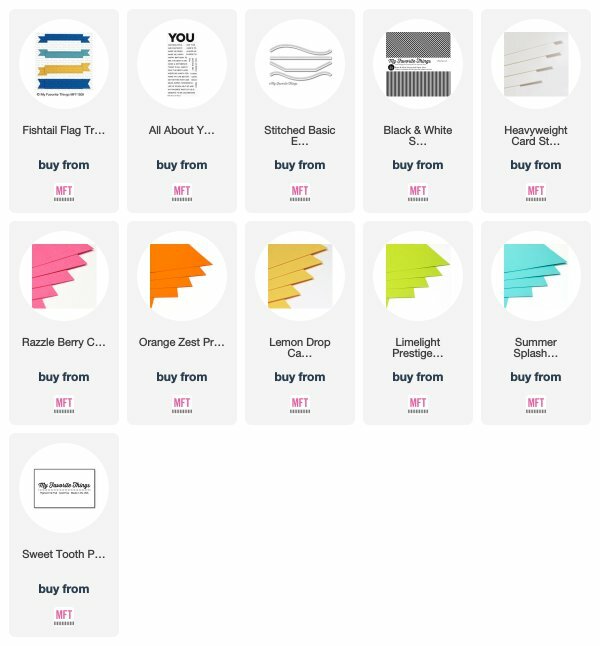 Paper Therapy: My Favorite Things - April Release MFT & Friends!! My Favorite Things - April Release MFT & Friends!! The time has finally come for you to get your hands on the new April Release products!! And I hope you are as excited about this release as I am! Today's project features the new Fishtail Flag Trio Die-Namics!! And I'm extra excited about this set of dies because I designed them!! I have always liked a true sentiment banner that is versatile enough for different flag configurations. Here, I've slanted the sentiment strips on a diagonal, and tilted the flags on each end to coordinate with the slant! I can't wait to play with the other configurations, and I hope you all like these dies as much as I do! I paired them with several of the sentiments from the previously released All About You Stamp Set. I've listed and linked all of the MFT Products that I used below. Please click on through to the MFT Design Blog to be linked to the other fabulous projects created by my teammates, as well as some of MFT's friends!! While you're there, be sure and leave some love along the way for your chance to win one of TWO $100 Gift Vouchers to the MFT Online Boutique! All of the April Release products can be found by clicking on the graphic below! Thanks so much for stopping by today!! I'll be back again tomorrow with a project for this week's Sketch Challenge! So I'd be ever so grateful if you'd come by again to check it out! Have an awesome day! Awesome card. :) Love the encouraging sentiments and bright colors. This is great! So bright and clean! What a gorgeous way to highlight those new dies- fantastic! Amazing card, love the colors. I love the rainbow banners. These dies are fantastic!! This is so fun!!! Love those banners; they look fabulous in all those bright colors! And the black and white stripes down the side are a perfect backdrop! Such a unique and creative use of the banners, they are fantastic! Loving the rainbow banner dies! Such a great idea! I love the colorful banners. Putting them on a slant has a lot of interest and I like the black pattern paper. That rainbow of banners plus the black and white stripes strip is just *chef's kiss* perfect. What a fabulous design. Thanks for sharing with us! The card just visually pops! What a great idea! You are so creative! This is a really great idea with wonderful pops of colour! love this cheerful design, it is a perfect and colorful flag display Karolyn, thanks for the inspiration! Awesome card! Love the dies and the fun colors! What a great idea for using the fishtail banners. Thanks! What a fun colorful card! This card just makes me so happy! What a fabulous way to use the banners and the different sentiments. I love love love this card! What a terrific way to use so many wonderful sentiments to send a super positive message. The new banner die is perfect for this! Nice colorful use of the banners. Awesome card. The colors are wonderful. 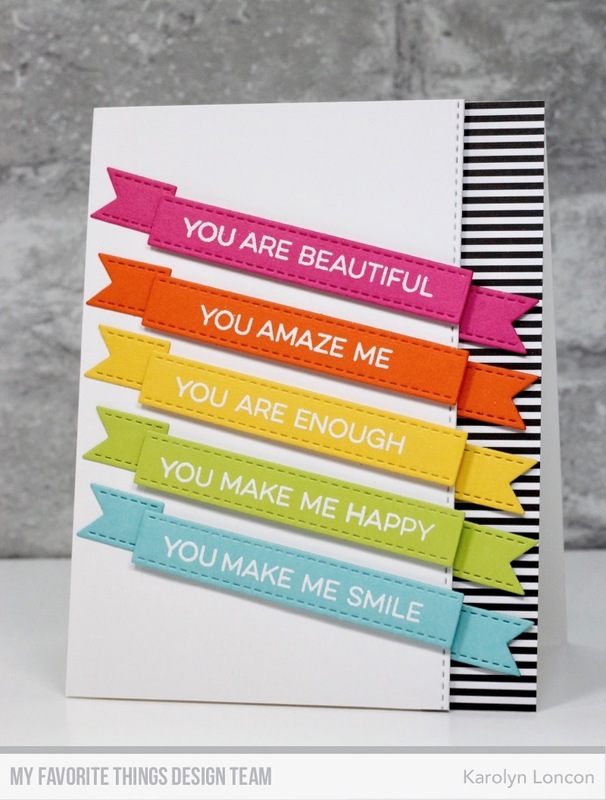 I love the rainbow of color you used on this card and then that black and white strip...so perfect! Fantastic card! I love the rainbow sentiment banners! I loved this card the moment I saw it. I thought.... I must case this design. Great job!! Love your card and the colors of the banners! And that black and white striped paper is perfect! Bright, fun and graphic! Fantastic card!